With the harsh weather conditions that have been forecast, gale force winds and the worst winter predicted for decades it is crucial you’re prepared so that you don’t come to a halt this winter. Prior planning is important especially if you are a business owner who has a large fleet of vehicles, who rely on their vehicles being on the road whatever the weather to ensure the smooth running of business. The winter months is a critical period for windscreens as the glass is most vulnerable. If a chip in the windscreen already exists the sudden drop in temperature can dramatically worsen the chip as the glass becomes weakened. This could mean the smallest chip in your windscreen could spread over the entire windshield which would result in an unsafe vehicle that was not road worthy. This would then mean you are having to potentially replace the entire windscreen as opposed to repairing the chip that was initially on the windshield. Car windscreens are extremely important as not only do they provide you with a clear vision of the road you are driving on they also protect you from weather conditions and debris entering the car when you are driving. Windscreens really are extremely important and in the winter months carrying out checks to ensure you windshield is safe and free from chips and damaged windscreens is crucial. Ensure you wiper blades are fully functioning and clean as sometimes they can be filled with tiny grit and stones this can cause damage to your windscreen which could result in a small chip. Use boiling water to melt away the ice off of your windscreen. This can crack the glass. Use your wiper to clean your windscreen this can actually damage your wipers. If you think your car or fleet of vehicles may have a stone chip don’t wait until the weather worsens call one of our expert glass repair engineers on 0800 043 0275 or fill out our contact form. 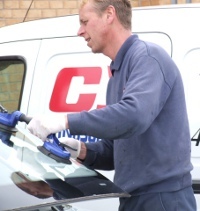 We can provide you with a quick and efficient windscreen repair or replacement service whichever you require even if you are at a remote location. We can remove your old windscreen quickly and replace it with a premium Pilkington glass windscreen.